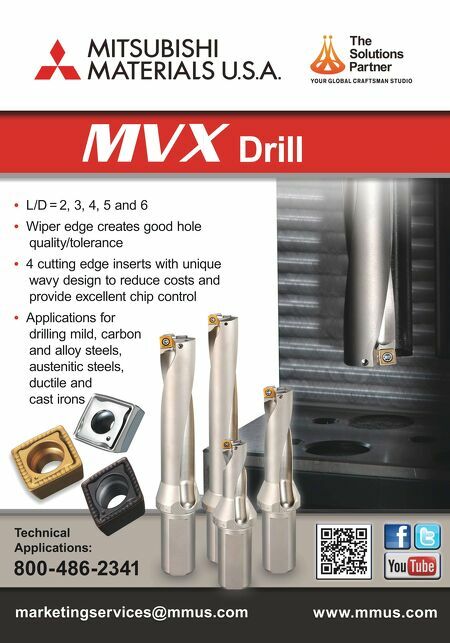 SHOP TALK MMS JUNE 2018 48 mmsonline.com Industry News Asian Trade Shows Reveal Focus, Unbridled Optimism MATT DANFORD | SENIOR EDITOR Tariffs and trade wars, not to mention combustible politics, make the world nervous. Nonetheless, testimony from many exhibitors at South Korea's larg- est machining exhibition, the Seoul International Manufacturing Technology Show (SIMTOS), was tinged with cautious optimism. 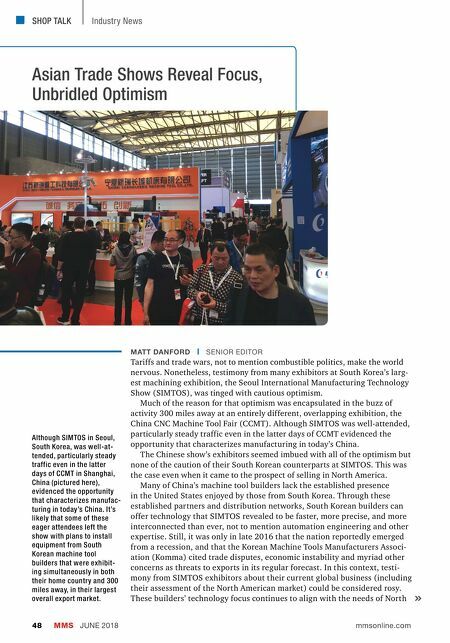 Much of the reason for that optimism was encapsulated in the buzz of activity 300 miles away at an entirely different, overlapping exhibition, the China CNC Machine Tool Fair (CCMT). Although SIMTOS was well-attended, particularly steady traffic even in the latter days of CCMT evidenced the opportunity that characterizes manufacturing in today's China. The Chinese show's exhibitors seemed imbued with all of the optimism but none of the caution of their South Korean counterparts at SIMTOS. This was the case even when it came to the prospect of selling in North America. Many of China's machine tool builders lack the established presence in the United States enjoyed by those from South Korea. Through these established partners and distribution networks, South Korean builders can offer technology that SIMTOS revealed to be faster, more precise, and more interconnected than ever, not to mention automation engineering and other expertise. Still, it was only in late 2016 that the nation reportedly emerged from a recession, and that the Korean Machine Tools Manufacturers Associ- ation (Komma) cited trade disputes, economic instability and myriad other concerns as threats to exports in its regular forecast. In this context, testi- mony from SIMTOS exhibitors about their current global business (including their assessment of the North American market) could be considered rosy. These builders' technology focus continues to align with the needs of North Although SIMTOS in Seoul, South Korea, was well-at- tended, particularly steady traffic even in the latter days of CCMT in Shanghai, China (pictured here), evidenced the opportunity that characterizes manufac- turing in today's China. It's likely that some of these eager attendees left the show with plans to install equipment from South Korean machine tool builders that were exhibit- ing simultaneously in both their home country and 300 miles away, in their largest overall export market.